A sound card oscilloscope might be exactly what you need if you are stuck in the frustrating “I don’t know what’s wrong with my circuit!” state. Oscilloscopes have helped me countless times when debugging both analog and digital circuits. But they tend to be expensive. So what to do? What is a Sound Card Oscilloscope? A sound card oscilloscope is an oscilloscope based on the sound card of your computer. By using your sound card, you can build your own oscilloscope for only a few dollars. And that’s pretty awesome considering that oscilloscopes often cost hundreds or even thousands of dollars! 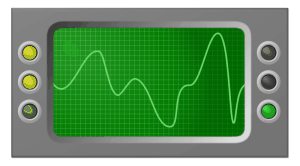 Audio signals are typical signals to look at in an oscilloscope. 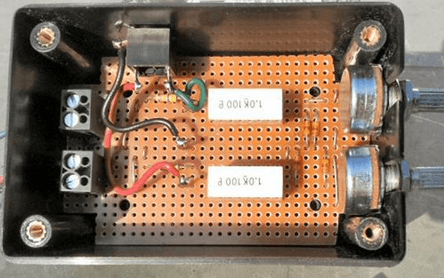 Imagine you have built yourself an audio amplifier. But you find that the output signal is really noisy. How do you figure out what to do to fix it? By measuring the signal in different stages in the amplifier, you can see where the signal gets noisy. This way, you can find out which part of your circuit is causing the problem. You can make some tweaks to that part of the circuit and measure again to see if it worked. Without an oscilloscope, you have to guess where the error is. And that’s not a very efficient method. Another example is if you are communicating between two electronic modules (like the serial communication on an Arduino). If you don’t get the result you expect, you can use the oscilloscope to check if data is actually being sent or not. I have used this debugging method many times. To build a sound card oscilloscope, you need a little circuit between what you want to measure and your sound card. This is to protect your sound card from being damaged. We call this circuit, together with measurement contacts, a probe. The schematic of one probe. Since a sound card usually have a stereo input, we can make two probes and measure two signals at the same time. Because sound cards have different internal resistances, the values to use in the circuit above varies. This also means that you won’t know the voltage level of the signal unless you also build a tuning circuit. Steve Garratt has written an excellent book called Sound Card Oscilloscope . Here, he explains all the steps of building a cheap sound card oscilloscope from home. From building the electronics to assembling the box and turning it into a good-looking tool. He explains how you can choose the right resistor values and how to build the tuning circuit. The book also gives you several examples of how to use a sound card oscilloscope in real life. I definitely recommend you to check it out. Click here to check out Sound Card Oscilloscope by Steve Garratt. I am the man that designed that circuit… thank you for the mention!!! !